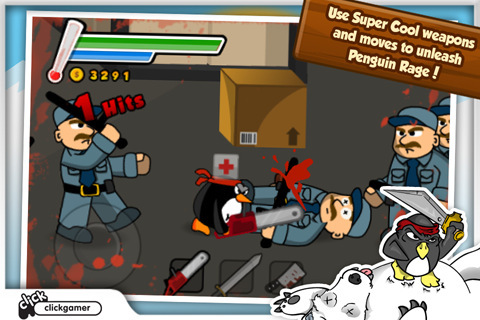 Ninja Penguin Rampage is a cartoonish bloody battle side scroller made for the humor-violent prone set that loves penguins, ninjas, and all those destroy-enemy-forces-zombie-type games that have become so popular. In the game, people have stolen your penguin friends and you’re the only one left to save society. You take the form of a fighting penguin and attempt to mow mow over more than 15 enemy kinds across 16 different leveled polar environments. Once you’ve mastered a chunk of storyboard mode a new survival mode unlocks where you’re pitted against a barrage of increasingly ruthless enemies until your last breath. As an aside, survival mode is particularly good for earning extra money before you take the stage against the real enemies in storyboard’s increasingly difficult levels. Regardless of your status in story or survival, blood squirts over icy environments of white as you knock out armed puffy Eskimos, ninjas and government agents. 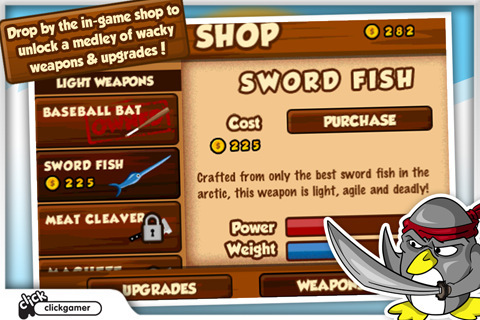 To defeat the enemies you can use everything from your bare hands to advanced weaponry that becomes available in the store as you collect coins and achieve more kills. 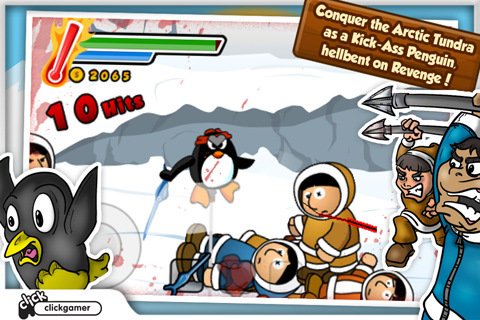 Overall, the premise behind Clickgamer‘s Ninja Penguin Rampage is genius. The graphics combine just the right amount of cuteness with a certain element of dark violence, giving it the perfect disposition to become a cult hit. After all, there’s a huge number of people who adore the thought of knocking people over the head with baseball hats and meat cleavers. When you’re playing, you’ve got to watch your health meter as you avoid spears while earning more money and making decisions on what you want to use to take the enemy down, and new levels provide new environments with enemies that are more resilient than the last. My major beef with Ninja Penguin Rampage though, is all about the controls. The direction pad on the left is sufficient in every way, but advanced controls like jumping or setting your weapon into action are rather sluggish. Instead of acting and reacting like a ninja, Penguin mostly floats about. And really in the end, any way you dice them, there’s not much variety in moving right as you kill everything in your path. 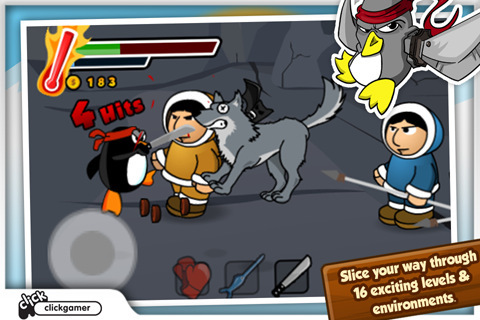 Still, Ninja Penguin Rampage is well done and I know plenty of people who would rejoice at the idea of playfully sledging people away after a rough day at work. There’s no doubt the game is clever, but it’s definitely targeted at a very specific set. 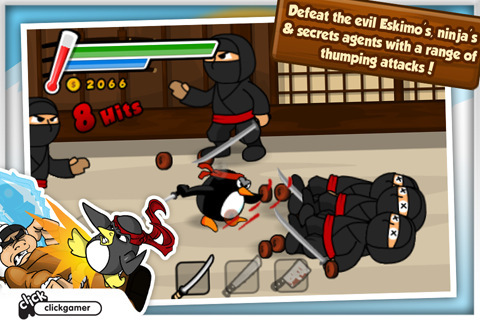 Bottom Line: You’re sure to find plenty of red snow in Ninja Penguin Rampage, but in the end the main purpose is to make sure that none of it is yours in this side scroller fighting game.